A black and white large format negative of Mr. & Mrs. Murdock and their wedding party on their wedding day, November 29, 1947. In this view from left to right: unidentified woman, Mrs. Murdock, Mr. James Murdock, Mr. Murdock. 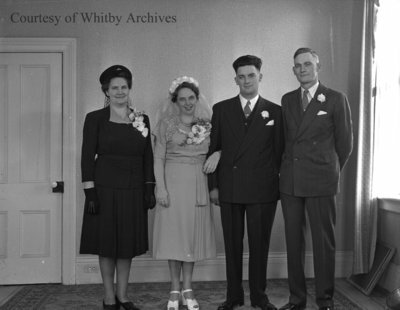 Murdock Wedding, November 29, 1947, Marjorie Ruddy. Whitby Archives, A2013_040_507.